I am a Rydoo Expense user, how can I enable the Travel Module? 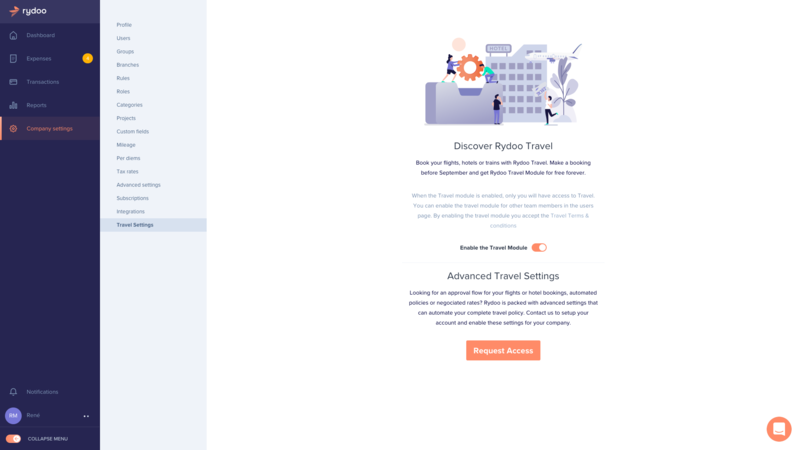 New Rydoo customers will not need to enable the travel module as it will already be activated from the start of your account. Admins of existing Rydoo expense accounts (former Xpenditure) can choose to enable the Travel Module, for all users or for specific users. 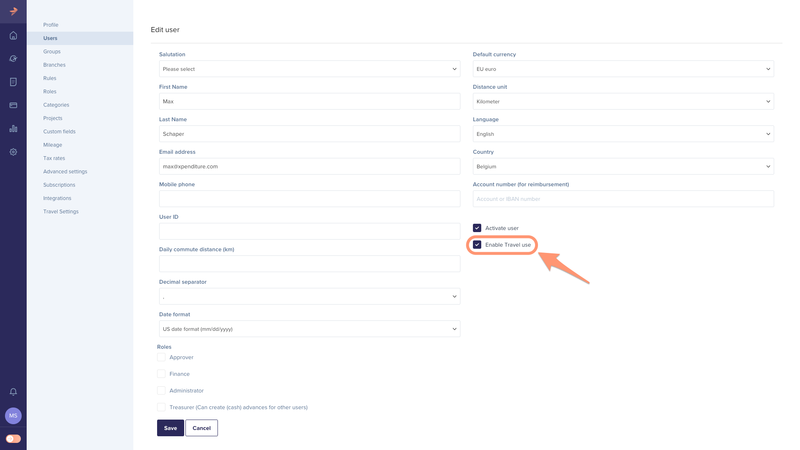 As an admin, you can find the "Enable the Travel Module" button under 'Admin Settings' / 'Travel Settings'. Once Travel is enabled, you can enable the Travel use on user level. To do so: 'Company Settings' / 'Users' > Select the individual profile > Check the "Enable travel use" button. Once your users are activated, please make sure that the user fills in all necessary information in their profile before they start booking. Upon the 1st booking in your company's account, you will be asked to fill out the Billing Information in a pop-up. You only need to fill out and submit this form one time. The details you provide here will be the default for your entire company. To trigger this pop-up, make a first booking and continue until you arrive at Billing Information. Please note that this pop-up will show up one step before you arrive at the payment page (where you need to enter in your credit card details). If you arrive at the payment page without arriving at this Billing Information pop-up first, this means that the Billing Information for your account has already been previously submitted. One invoice is sent per day to this specified email address for your company’s account. All bookings within the 24 time frame will be included in the invoice. Please click here for additional travel payment FAQs.